Sushi is by far one of the most delicious Asian cuisines loved all over the world. However, it's a very intimidating food to make. Have no fear, the handy sushi mat is here! These awesome flexible mats help shape and roll sushi easily. So, we found some of the best sushi mats on the market just for you and reviewed them. Read on and get rolling! Lay your bamboo mat flat with the slats horizontal. Place your nori (seaweed) with the shiny side down on top of your mat. Using your rice paddle, spread the rice in a thin, even coat on the seaweed. Be careful not to rip the seaweed! Place your ingredients in a strip along the middle. Move the seaweed all the way to the edge closest to you and carefully roll the sushi away from you. Use a little water or sesame oil to seal the remaining seaweed on your roll. You can also use incredible sushi mold presses to assist your nigiri and other styles of sushi making. Need an awesome sushi mat starter kit? This is definitely your best bet. This fabulous sushi making kit includes all the necessities for making delicious sushi for a great price. Not only do you get a sushi mat, they also give you an extra so you can make sushi with a friend. The mats also feature a flat green side, which makes placing ingredients and rolling much easier than standard sushi mats. Also, the kit includes a rice spoon and smoothing paddle. Don't forget, this awesome kit comes with four sets of chopsticks, so you and the family can enjoy sushi together. Overall, this is an excellent sushi making kit. You and your family will love this addition to dinners! As most of you know, everything looks good in black. In this case, you can make your sushi making look sleek and fashionable. Sushi making never looked this good before! This incredible black sushi mat is made of silicone, which is much easier to clean and maintain. Also, the silicone materials keeps your mat from molding and holding in strange odors. Plus, the kit includes two pairs of chopsticks and a rice paddle for smoothing your ingredients in your rolls with ease. For the more lazy days, you can even throw everything in the dishwasher! In the end, this is a great sushi mat and making kit for those who want to add a little fashion to their sushi making. Need an all-in-one sushi mat starter kit? We got the kit for you. These mats are made from matchstick rods of bamboo woven together with cotton string. Not only do you get one mat, but you also get another so you can make sushi with the family! The kit also includes a rice paddle, perfect for mixing in seasoning and vinegar to the sushi rice. Also, you can use the rice spreader to get a perfect even coat of rice on your roll. As a bonus, they include a two-compartment sauce dish for dipping your sushi creations. Plus, everything in the sushi making kit is all natural and made from bamboo, which is the most renewable source on the market. In the end, making sushi has never been so easy! No more complicated sushi machines and confusing parts to add to the arsenal. Finally, you can recreate incredible Japanese sushi in the comfort of your own home with this sushi mat. If you're looking for a quality product worthy of a sushi chef's kitchen, this is the product for you. This sushi mat is unlike other traditional bamboo mats. Made from ultra-durable plastic, this sushi mat with stay with you for life. You won't want to let it go! Coming in at a jumbo size of 12" x 10", you can make rolls of all sizes. Also, the surface was purposefully designed to have direct contact with the ingredients. No more using up plastic wrap wastefully. Plus, clean up is a breeze with this hygienic design. Simply hand wash or place in the dish washer. 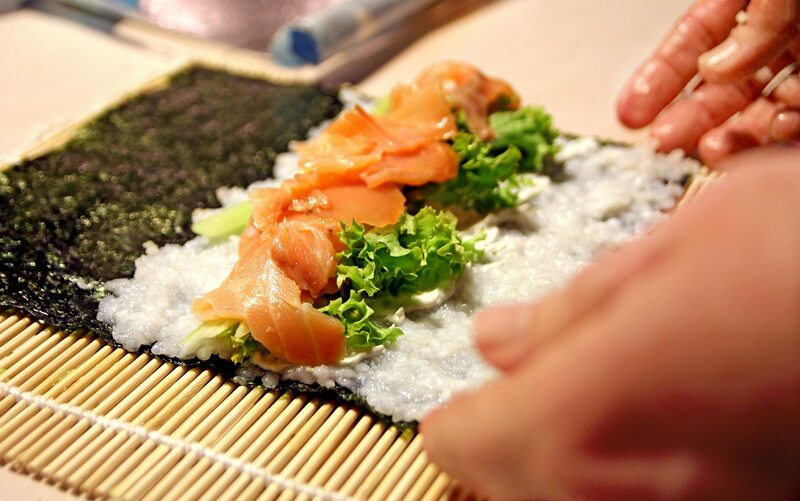 Overall, we absolutely LOVE this sushi mat for its cleanliness and ease of use. For those of you who are cooking professionals, this is a must-have in your kitchen. Have you been perplexed on how to make delicious sushi like a sushi chef? Well, wonder no more because this sushi making kit is the answer to all of your questions. The bamboo roller, rice paddle, and chopsticks set are the key tools included in this set that allow you to make perfect rolls, every time. Use the sturdy rice paddle to measure even amounts of rice and spread onto your seaweed. The bamboo mats are faultlessly fixed together and provide a non-stick surface. Reusing the odorless mat several times will not make the strings loose easily. Just wash it together with the rice paddle and chopstick and let dry. So, what are you waiting for? Get this sushi making kit now and start making delicious sushi at home. For those of you who are looking for the best sushi mats on the market, this is the product for you. When it comes to efficiency, this silicone sushi mat takes the lead. The silicone material makes it super easy to clean and keeps germs and mold away from your mat. Also, the material was designed for you to put ingredients directly on the mat, making it extremely hygienic. Plus, the mat and paddle are both dishwasher safe and freezer safe. For the beginner sushi makers, this kit includes an e-book on how to make sushi as well! Overall, this is an excellent sushi making kit for those who want maximum efficiency in the kitchen. For those of you who love sushi, this kit provides everything you need for the complete sushi-making experience. Included in the kit are two full size ROLLING MATS measure 9.5” x 9.5”, a rice spoon and spreader. You can use the rice spoon to mix the rice and vinegar to perfection. Also, the spread works great for keeping an even spread of rice on your nori. Each item in the Sushi-Making Kit is constructed of top quality bamboo material. Fortunately, there are no splinters and no unraveling of the cotton string stitching. To extend the lifetime of this kit, hand wash only. Also, do not expose to high heat and dry each piece thoroughly. Whether you’re a beginner, a world class professional sushi chef or a culinary student, this kit has everything you need to make an original snack in just a couple of minutes. © Copyright Nomlist 2018. All rights reserved.